Mary goes out with a “Glam Slam” and a rather nice fellow! 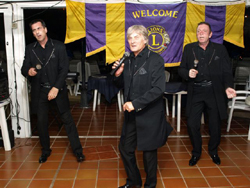 Santiago Del Teide Lions Club held their President’s Night Celebrations on July 4th, at El Marques, Los Gigantes. 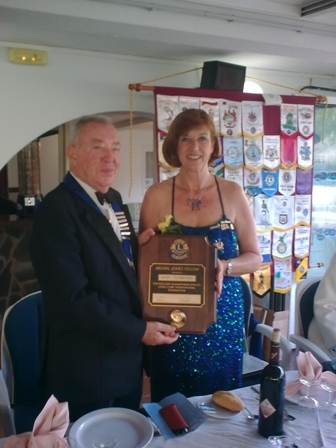 In her address, retiring President Mary Thompson, thanked the Club Members for all their hard work, over the last twelve months, and the general public for all their support. Of the organisations that have received assistance from the Club over the last year, she highlighted the Bomberos, the Orabal special needs and family centre, and the completion of the ‘Computer Project’, which is to place, in 19 of the local junior schools, a new computer suite. This was funded by Jens Fulda a local businessman. She gave special thanks to Secretary Jon Thornley and Treasurer Steve Gilbert. The Club’s internal award, by popular vote as ‘Lion of the Year’ went to Lizzie Herrick. 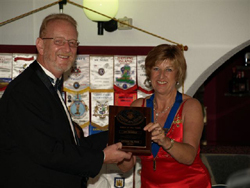 Incoming President Richard Dobinson thanked all present for supporting the evening, and promised a continuation of the Lions’ work in the future. After an excellent buffet prepared by the El Marques staff, the evening continued with entertainment from ‘Extreme’ Carla and Michell’s Speciality Show. The icing on the cake for the whole night was supplied by another super performance from ‘Glam Slam’ the top 70’s rock tribute band. 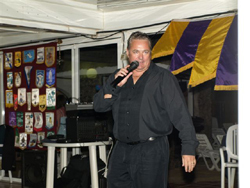 Thanks go to Rick Porter for his support role, and to Maggie Porter and Denise Bell of Viana Shows for organising the evening’s entertainment. Lions presidents night is the night when we celebrate the start of a new lion year and traditionally the president officially hands over power to a new president who has been elected by the club in a democratic (no arm twisting, vote rigging or opposition killing allowed) election. This year was no exception, the main difference being that our current president was unanimously voted back for a second year in office. Mary Thompson is now going into her second year as Lion President and her speech was short and to the point. Mary also, as is traditional, handed out a number of awards. The Lion of the Year award this year went to Club Secretary Jon Thornley. (pic right) and appreciation awards went to Ken Ward, Sheila Widdrington and Richard Dobinson. 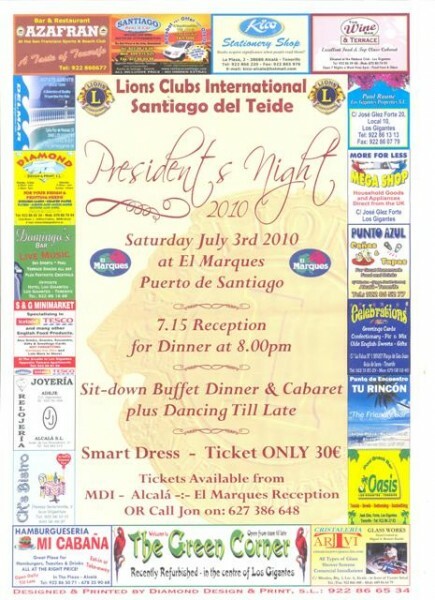 Then night was held at El Marques in Puerto Santiago and what a fantastic night, the food was a sumptuous buffet, the staff were helpful and polite, José the head waiter was only too happy to help with last minute seating plan changes. The entertainment was superb, Rick Porter had one of the hardest jobs of the night providing the pre-dinner and background music for the evening, he was followed by Steve Delsey (left) a very funny man who had the audience laughing with some very quick humor, and then just to show his talent more he finished his show with an operatic song Nessun Dorma, which had the audience on there feet in appreciation. Next Rick was back with some dance songs to get the dinner worked down, then a special surprise Tuxedo Nights(right), a close harmony singing trio, Tom Bell, Eddie Hastings and guess who, yep the one and only Rick Porter, had every one up and dancing, and brought the night to a fantastic close.